Classic career counseling models have focused almost entirely on practical and prescriptive methods aimed at occupation with little attention to the process nature of life which is inclusive of work but not limited to it. Moving beyond the models, Anna Miller-Tiedeman has written the New Careering, an innovative approach that advocates a theory of life, not job as career. Miller-Tiedeman's model focuses on the career theory of the individual by addressing logical, emotional and spiritual aspects. The New Careering, based on the principle of flow, uses as its foundation ideas from a broad range of theories including, but not limited to, quantum physics, Bohm's notion of wholeness, and Self-Organizing Systems Theory. This broader view of career places individuals in touch with their deeper spiritual selves. 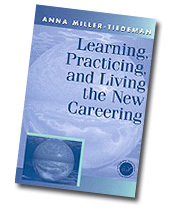 Learning, Practicing and Living the New Careering presents a theoretical overview of conventional career counseling theories and compares them to the New Careering. This volume does not dismiss traditional career theories, but rather illustrates the symbiosis while placing conventional wisdom in a subordinate to personal reality. Miller-Tiedeman uses case studies and discussion points to help both professional and students learn practical application. This ground-breaking text is ideal for use in classes as it includes end-of-chapter questions, in-class exercises, and potential homework assignments. It is appropriate for beginning counselor education courses, career classes, entrepreneurial classes in business administration, career classes in other disciplines, church groups, pastoral counseling class, support groups, study groups and mental health groups.